I haven't made stir fry in a while so I got some veggie ingredients at the store and came up with a great recipe! The pineapple in this stir fry give it an unexpected sweetness when paired with spicy Sriracha sauce. I don't have an exact recipe for this, I just added veggies and rice to my liking. Use as much as the ingredients as you want but I like to keep an even ratio between them. 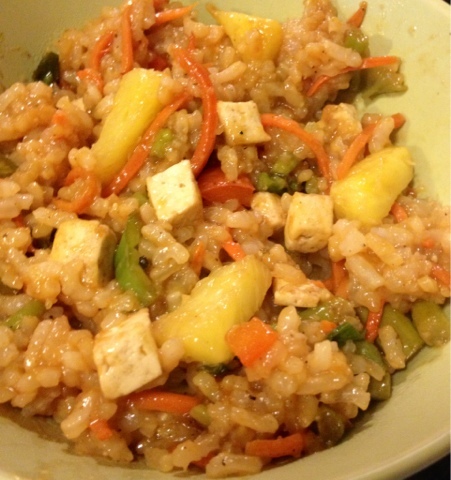 You can whip this up in 10 minutes if you already have cooked rice and chopped veggies. Feel free to experiment with the ingredients! 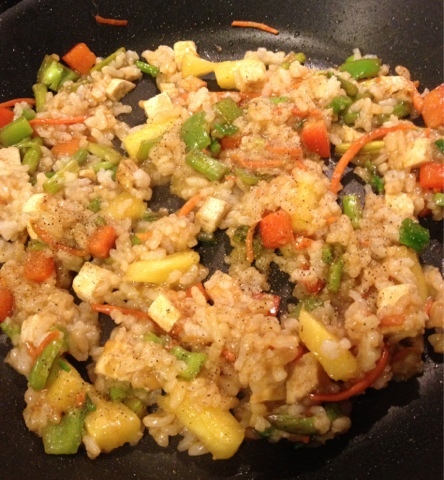 First, cook the rice if you haven't already (this can be done while sautéing depending on the type of rice). Then, heat a tablespoon of olive oil on a large pan over medium-low heat. Add chopped tofu and cook for a minute. Then add the rest of the veggies while adding some soy and stir fry sauce and stirring. Add the pineapple last. Sauté until the veggies are soft. Finally, add the rice and stir together. Add the remaining sauces (about a Tbsp. each total) and spices. Serve immediately! Note: I've been using white rice because I need carbs for running. However, if you are not exercising in a high volume, you can use brown rice. I've learned from my own experience that brown rice is difficult on my stomach because it's harder to digest (the bran that makes it brown isn't removed). White rice is actually easier to digest and the nutrition value between brown and white rice is not that different. Do you eat brown or white (or other) rice? This looks sooo delicious. I love things that are sweet & savory. Vega One Starter Kit GIVEAWAY!! Team Bright Pink Fundraiser at Lottie's!